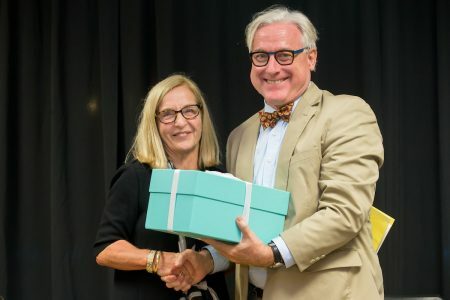 In September, Randolph College presented Alumnae Achievement Awards to two outstanding graduates, Carla Alexander ’68 and Lucy Williams Hooper ’73. Also during the annual ceremony, Randolph named Skip Kughn an honorary alumnus for his many years of service to the College. Since 1981, Randolph has presented the Alumnae Achievement Award to alumnae who personify the value of a liberal arts education and have brought distinction to themselves and to the College. Nominations for the awards come from alumnae and alumni, and the recipients are selected by an awards committee. Past Alumnae Achievement Award recipients are listed on two plaques in the Anne Jeter Ribble Lounge in Smith Hall and include an impressive roster of women including judges, senators, pilots, medical professionals, educators, ministers, TV journalists, environmentalists, and civil and human rights advocates. Carla Alexander ’68 accepts her Alumnae Achievement Award from President Bradley W. Bateman. Carla Alexander ’68 has dedicated her life and career to making a difference in the area of palliative and end-of-life care, specifically for those with HIV/AIDS. In fact, she has provided clinical care for people with the disease since the beginning of the epidemic. After graduating from R-MWC in 1968, she went on to earn her M.L.S. from the University of Maryland before earning her M.D. from the University of North Carolina School of Medicine. Board certified and a Fellow of the American Academy of Hospice and Palliative Medicine (or AAHPM), Alexander has practiced hospice and palliative care since 1986 and is a founding member of the AAHPM, serving as president in 2000. She has taught elements of palliative and end-of-life care related to HIV/AIDS throughout North and South America, 11 African countries, Eastern and Western Europe and the UK, Ukraine, and Asia. Her research has focused upon palliative and end of life needs of persons with HIV disease with a history of substance abuse and poverty. Alexander currently serves as an assistant professor of medicine in the department of medicine of the division of infectious diseases for the University of Maryland Baltimore School of Medicine, and is the medical director for the University of Maryland Medical System. She serves on the clinical council with all of the department chairs at the hospital. She is principal investigator for a three-year award for implementation of care and support for retention in HIV care from the Patient-Centered Outcomes Research Institute. Prior to joining the university, she was director of clinical affairs for Chase Brexton Health Services, Inc., a community-based facility that provided primary care for persons with HIV/AIDS. Lucy Williams Hooper ’73 accepts her Alumnae Achievement Award from President Bradley W. Bateman. 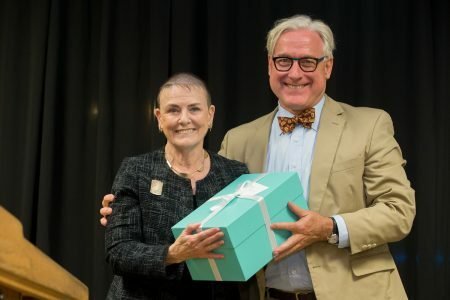 Lucy Williams Hooper ’73 has been a long-time supporter of the College, giving tirelessly of herself, her time, and resources for the Alumnae and Alumni Association and as a member of the Board of Trustees. An economics major and member of Phi Beta Kappa, Hooper has made a name for herself in the field of finance. After graduating in 1973, she entered the banking industry as a trader and in fixed income sales for First and Merchant Bank, which later became Sovran Bank. Breaking the glass ceiling in the male-dominated finance world was not easy, but Hooper has made her mark. She was the first female broker at Davenport & Company in Richmond, Virginia. Since joining the firm in 1981, she has held various fixed-income positions. She remains there today, serving as executive vice president and director of fixed income. Just recently, the Municipal Securities Rule-making Board named Hooper its chair. The board, which has 11 independent public members and 10 members from firms regulated by the MSRB, including broker-dealers, banks, and municipal advisors, establishes regulatory policies and oversees the operations of the MSRB. She’s been a member since 2014. On campus, Hooper is perhaps best known for her long involvement with the College. She has served the Association in numerous leadership positions, including chapter president, district director, first vice president, and also the representative to the Board of Trustees. She also volunteered as a class agent and for Reunion. Hooper spent 12 years serving her alma mater on the Board of Trustees, five of those as the Board’s chair. Through her leadership and expertise, Hooper was able to help guide the College through a tumultuous time, while also juggling her own time-consuming job and family responsibilities. Though she left her position as chair in 2012, she is still involved with Randolph’s Board of Trustees and chairs the investment committee, which is a subcommittee of the finance committee. Hooper is also very active in her community. She has served as a director of the Virginia United Methodist Foundation and was a trustee for the Children’s Museum of Richmond. She also has been a trustee for Randolph-Macon Academy since 2013. 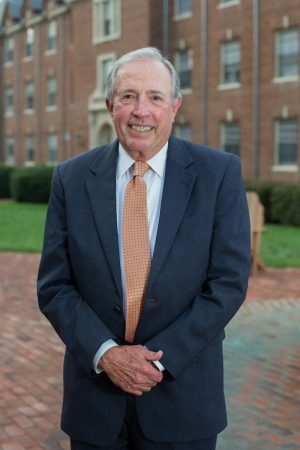 Skip Kughn was hired by former President Bill Quillian and first began his career with Randolph-Macon Woman’s College in the Development Office in 1977. He is now just the second male—besides Quillian—to be named an honorary alumnus of Randolph College. During his tenure, Kughn worked in institutional advancement, development, admissions, and college relations. He served under eight different presidents and led three major capital campaigns. The Board of Trustees figured that at the time of his retirement in 2009, Kughn, through capital campaigns, 32 Annual Fund campaigns, and special fundraising efforts, had generated well over $200 million for the College.